Comfort and functionality combine to shape this beautiful black/chocolate bench. This bench provides extra seating, valuable storage space for shoes and has a durable wooden frame and showcases a chocolate microfiber upholstery. Black / Chocolate Micro Fabric Shoe Rack Organizer & Hallway Bench. 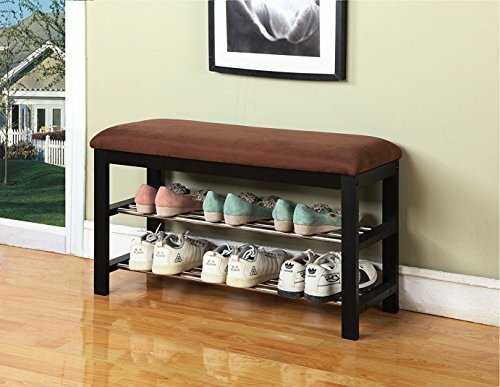 Can be used as a shoe organizer, bedroom and hall way bench with microfiber fabric upholstery seat cover on a black wood base. Features 2-tier of shoe storage. Dimensions: 32" W x 12"D x 19"H.